Learn about interior and exterior painting ideas such as wall painting techniques, interior house painting tips, etc. This is a timeless country look with a twist that is welcoming in either the countryside or the city. The desert-colour palette is melded with modern furniture to deliver an exciting update to authentic Southwest decor. The warm sunlit room is a welcoming environment for rest and rejuvenation. Details include pottery, native textiles, denim, tooled leather, plus desert plant life for indoor gardens or terrariums. To create it, use: The Behr paint palette of Prairie Poppy T12-1, Stagecoach T12-2, Canyon Sunset T12-3, Darlin Clementine T12-4, and Lone Star T12-5. This style reflects back on a time before the internet, mobile apps and social media. Interacting with computer games in the 70s and 80s meant going to the local video arcade and playing Pac-Man. Early screen colours were bright primaries, mixed with black, white and grey neutrals. Retro Recall is a clean urban style for “kids at heart” who remember the analog games of their childhood. 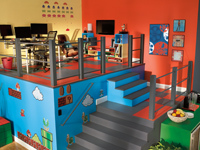 Add cubed shapes, lava lamps, movie posters and action figures. Enhance this clean and urban look with touches of light-hearted, techno-geek nostalgia. To create it, use: The Behr paint palette of LOL Yellow T12-6, Red Wire T12-7, Reboot T12-8, Level Up T12-9,and Game Over T12-10.